Like money? Of course you do. That’s an absurd question really. I know the mysterious “they” say money doesn’t bring happiness but it certainly takes a whole lot of stress off when we have more of it, am I right? Less stress=More happiness. “They” also say money doesn’t grow on trees but I refuse to have my dreams crushed by a pessimistic group whom I’ve never met and am not totally convinced exists. I mean, where do they congregate to come up with all of these silly “truths” anyway? If you’re part of the 100% of people who like money and would like to know of ways to diversify your income than this class is for you! Liz shows you how to effectively use social media, something completely foreign to most (the effectively part), to bring you more exposure and business! This information is helpful to anyone running any kind of business. You’ll also learn how you can take what you’ve already been doing and BOOM make it bring in revenue in other ways you’ve probably never thought of or have been too afraid to try. How cool is that?! Liz breaks it all down to make it less overwhelming from what and when to post to websites and resources. You definitely want in on this. 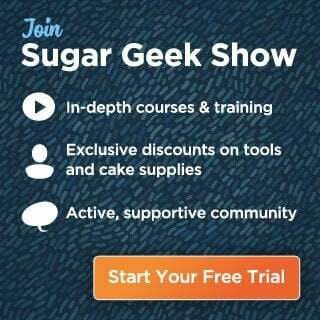 Check out the preview video below and Sign up to be a Premium or Elite Member of the Sugar Geek Show to get this along with hundreds of hours of other awesome info! You can also check out the extra free advice Liz gives about Getting Better Clients, Cake Pricing, and How to Make a Great Cake Website all to help make you more money! These are live Periscope broadcasts that have been recorded and are very lax compared to a formal tutorial or class but that just makes it more fun. Like these easy-going advice packed sessions? Visit Liz’s YouTube Channel for more! So go on, get out there and start making more money!